Clearwater Beach was packed with beachgoers below, but the weather was fantastic and the view was amazing from the Sky Terrace at the Hyatt Regency Clearwater Beach this past Saturday afternoon for Candice and Kevin’s wedding ceremony. Candice was escorted down the aisle by her father and joined Kevin at the head of the aisle. 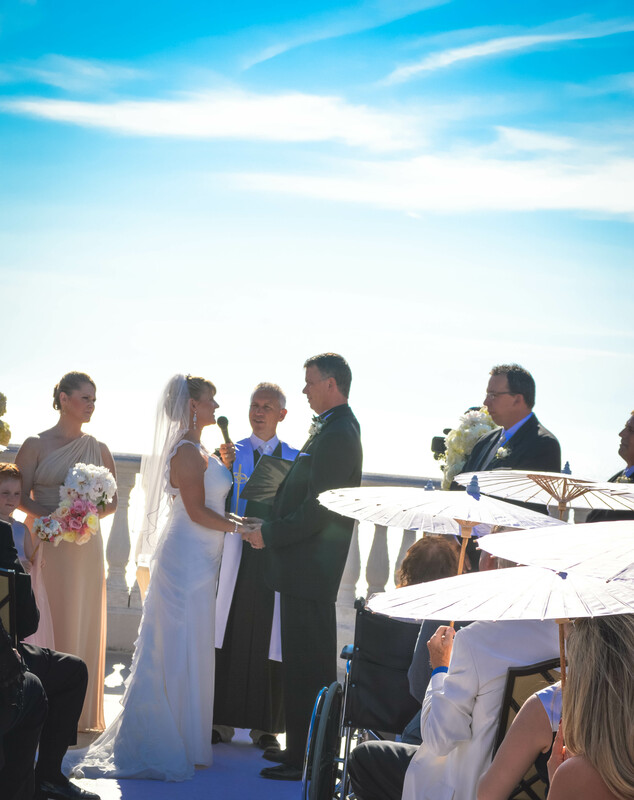 There with the blue sky, white puffy clouds and the Gulf of Mexico as their backdrop the couple enjoyed an intimate ceremony with family and friends and were pronounced husband and wife by Rev. Rick Lackore of Sensational Ceremonies, LLC . Candice’s wedding dress was provided by The White Closet Co.; florals and décor by Eve’s Florist; videography by Hearts Video; and venue coordination by Catering Sales Manager, Mallori Skipper and Catering Coordinator Michelle Gianfalla and the rest of the staff at the Hyatt Regency. This picture was provided by Tammy Lackore. Congatulations to the new Mr. and Mrs. Kevin Dunn!